P. Vossen, S. Báez, L. Bajčetić, and B. Kraaijeveld, “Leolani: a reference machine with a theory of mind for social communication”, invited keynote speech, in Proceedings of TSD 2018, Brno, June 05, 2018. Download paper. 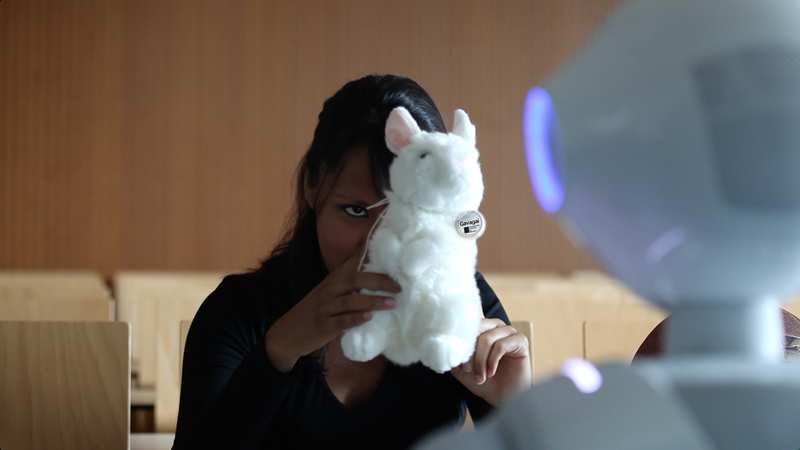 Object Recognition: Selene Báez showing Pepper robot Leolani a plush rabbit (see our repository for Pepper applications at GitHub). by hunger to acquire more knowledge from and on people and objects, to resolve uncertainties and conflicts, and to share awareness of the perceived environment. Likewise, the robot can make reference to the world and its knowledge about the world and the encounters with people that yielded this knowledge. Visit our Pepper robot Leolani GitHub. Object Recognition. Frames from robot cam: Leolani recognizing Person (81%, 86%, 89%), Bram (100%), Chair (82%), Bottle (81%), Laptop (94% and 98%).